Dedicated to BMS pilots: Thanks to Olivier Beaumont aka “Red Dog”, Tacview now offers by default the maps of the most popular BMS battlefields. No more fussing with download and configuration files, enjoy right away more comfortable debriefings over Korea, ITO, Aegean and the Balkans. To reduce the installer size, I have not included all the possible maps, so just let me know if you think that I have missed an important theater map which should be in Tacview by default. Behold the new trimming tool! With it, you can now select and keep only the most relevant part of your last flight. Share smaller files with your friends and enjoy debriefings which go right to the point! 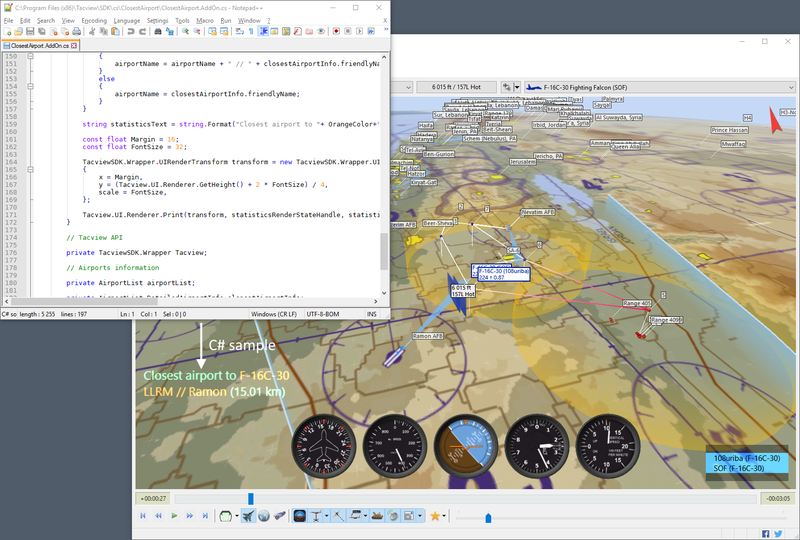 This version also brings the long-awaited C# SDK for Tacview Enterprise customers. With an API which is virtually identical to the Lua and C++ ones, it is now possible to quickly develop powerful addons for Tacview. As usual, this version brings a few fixes as well as some optimizations in the telemetry manager. Check the release notes for more details.